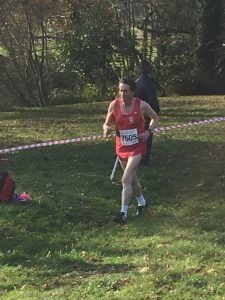 Barrie Roberts reports: After a few weeks of frenetic activity (B’ham Half Marathon, Conductive Education 10k, Midland Counties 6k XC Relays, BMAF 3k XC Relays and B’ham XC League (Div 2) & sports massages at Kings Norton, I found myself selected for Wales (as a named Reserve) for the annual British and Irish XC Championships. Two days prior to the event I was informed that I was selected for the actual Welsh Team. I was particularly pleased because I had run the XC Championships in Swansea 10 years previously, and had run quite well at the time. Also, Swansea was the town of my upbringing/formative years. On Saturday morning at 10:55am we assembled for the Welsh Team Photo. Soon after that at 11:30am prompt, I was ‘under way’ in the first race of the day; namely, all the Women and the M65+ categories. The XC Course was quite tough, but the going was for the most part firm, with isolated mud/water features – and the grass was quite long in places. I had to run three clockwise laps (3x2k) on, for the most part a steep incline (some people thought that it was more of a hill! ), but my blunt 15mm spikes kept me upright for the most part i.e. I didn’t fall! The sun did come out occasionally, but there was quite a fresh breeze much of the time – and the temperature was cool, but not too cold. 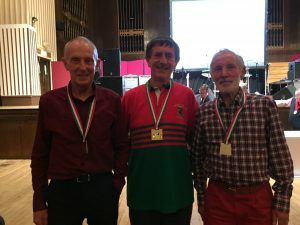 On the last lap I managed to overtake an Irishman, a Scotsman and an Englishman – (all in my age category) and completed the 6k distance in a time of 33:20, which was one of my better races for some time. But I still think that I have the tendency to run XC rather than race XC (maybe, I need to acquire the services of a Sports Psychologist!). I enjoyed the opportunity of ‘running for my country’, but have to admit that I was in ‘very good company’. My fellow Team members included Emyr Davies – 27:57, Brian Gough – 30:49 and Peter Moody – 31:17. It wasn’t until the Dinner/Presentation Evening, later in the day, that I found out that ‘we’ had won the Team Gold. I was surprised, but nevertheless delighted with our success. Thank you to all the supporters, including my wife Katie who, although she doesn’t race very often, trains regularly and is getting faster by the day. The overall XC Championships were won, as usual, by the England Men/Women’s Teams. Next year the XC Championships are being held in Southport. Do look at Power of 10 Results, and the BMAF Website to see what different age categories (Men/Women) can, and do achieve. P.S. It would be great if there were some other BvHers there. We have some excellent, and potentially very good XC runners, at Bournville Harriers.The Results of the Midland XC Championships, and the Inter-Counties Championships speak for themselves.